From our Southeast Asia Collection, a truly exceptional lacquered and gilded woven-bamboo basket known as a Ko Kaw Tee, from the Kengtung region in Burma, which is the area of the eastern-most part of the Shan States bordering China. This exceptional example features eight individually crafted alto-relief figures of native tribesmen separated by eight triangular-shaped cartouches of heavy gilding, with the entire composition bordered on the top by a wide band of scrolling gilded thayo, and supported on the bottom by a set of four short legs adorned with crow motifs. According to Singer and other published experts on Burmese lacquerware, the headdresses, clothing, and instruments depicted by each of the alto-relief figures, is supposedly representative of one of the various local ethnicities in the Kengtung region. This present example, without question the finest we have ever seen, is signed in Burmese script by the maker Hsaya Tay Ya and dated 1930, this appearing on the underside of the basket in a diamond-shaped gilded cartouche accompanied by a crow motif. Other pieces from the 1930's by Hsaya Tay Ya are well-known, documented, and published, with several of these now held in important museum collections. Size and Condition: 9 inches in diameter, 5 3/4 inches tall. 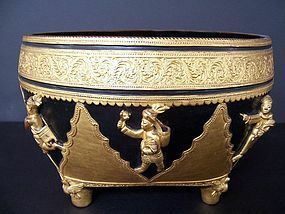 Excellent overall condition: There are some small areas where gilding has been retouched, and some minor flaking to the black lacquer on the interior of the basket. More importantly, all of the relief figures are in superb original condition and have survived without damage, and apart from minor wear commensurate with age and light handling, this example is in excellent condition. Extra Photos for Item 990732, Published Burmese Buddha A Large, Published, Inscribed, Dated, Burmese Buddha A Good and Large Vintage Indonesian Batik "Painting"